In one of the best issues to date, in a story called ‘Mine Eyes Have Seen the Glory,’ Rom comes to the rescue of a little girl who has no idea just how dire her situation is. Part of that is because of her blindness and the other due to her captor, her so-called aunt who is in fact a Dire Wraith sorceress. The story is haunting, moody and atmospheric and almost seems like it could be a gothic romance if there was indeed any romance present. There is the old spooky house on the cliff, the young girl dressed all in white and her domineering aunt and it is just like watching a horror movie from the 1940’s. There is drama and pathos in abundance and you feel bad for the little girl and her situation. It is good fortune then that Rom happened to be in the area, tracing the trail of a Dire Wraith to her locale, for if he had not, she most likely would not have remained a little girl for very long. Usually the best Rom tales are the ones that involve a little horror, those that are a little darker than the ones that involve say, Rom fighting some super-villains or the creature of the week. 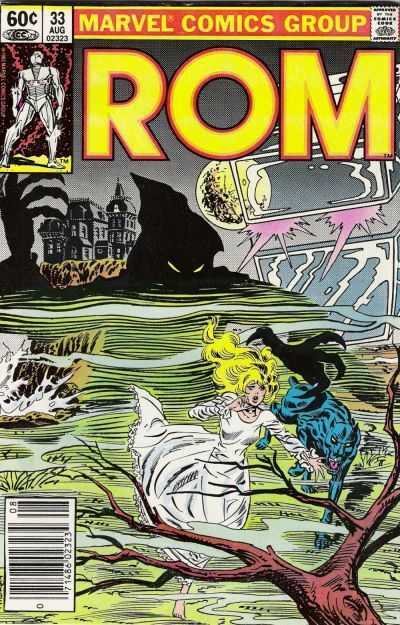 How it comes to be as such is a good question, but whenever Bill Mantlo decides to take Rom down a path where things might go bump in the night, we as the readers know that the story will be a good one and that we are in for a treat. Science-fiction and horror have always blended well together and though it might seem a little odd to think that a giant silver robot would do well in such a tale, then one only has to pick up this issue or any of the others that have featured a similar theme to be proven wrong. A truly great issue by Mantlo and Sal Buscema.